Trinitas 2007 Batch Centenniales is now available at the Registrar's office. Get your copy now! The Basic Nursing Science Research Department of this institution is currently conducting a graduate tracer study of its alumni. Please fill in the necessary information by either clicking your desired choice and/or typing necessary information in several text boxes. Rest assured that we will treat all the information that you had furnished to us with utmost confidentiality and all the data will be strictly for research purposes. You can now easily submit/share an online content such as videos, news, pics, announcements, poems, stories, artwork, etc. Anything that you would like to submit for this site. Just click the "SUBMIT A CONTENT" link below or "Contact Us" that can be found on the navigation links just below the SLCNWEBS header. Links are also accepted. Just send us the link of an online content then we will do the rest. *NOTE: For big files, you can directly send ot to our email address: slcnwebs@yahoo.com. Please include your names when you submit a content so that due credits shall be given or if you want to be anonymous, that's fine. The St. Luke’s College of Nursing will be launching a scientific journal in 2009 featuring research studies done by your batch. May we invite you to contribute an excerpt of your undergraduate thesis to the upcoming journal called “SLCN Journal of Health Science” (SLCN-JHS). The SLCN-JHS shall feature articles in diverse areas – clinical practice, community health, occupational health, environmental health, nursing care and management, health education, nursing education, research, management and ethics. Articles should not exceed 8 pages. Please see attached format for more details. Format may also be downloaded at http://idisk.me.com/nicogonzales-public. Please turn in your manuscripts preferably before October 15, 2008 to allow us enough time to prepare documents for publication. Please seek advice from your adviser, any faculty member of SLCN and/or Nursing Science Research Department (NSRD) in the preparation of your manuscript. Articles are not expected to cover all aspects of your thesis. Select specific objectives that are to be included. You may seek help from the NSRD if you require a reanalysis of your data. There will be a TEA PARTY on the 16th of August , 4PM, sponsored by the alumni association (venue might depend on the number of attendees, most likely Mandell Hall). The tea party will be shared and celebrated by the 3 batches (Invictus, Centenniales & Magis). JUNE 2008 NLE Result, OUT NOW! TUA is #1! Congratulations to Trinity University of Asia - Batch Magis for being the top performing school in the June 2008 NLE! We're so happy for all of you. Once again your batch have proven to be the best! Thanks for giving glory and honor to your Alma Mater, Trinity University of Asia - St. Luke's College of Nursing!To all the new nurses of the Philippines... CONGRATS and God bless you all! MANILA, Philippines -- Filipinos aspiring to jump on the nursing bandwagon should think twice because the once burgeoning demand overseas has begun to wane, according to the Philippine Nurses Association (PNA). “Many licensed nurses are now underemployed or unemployed as a result of changes of policy in destination-countries, the current situation of oversupply, and quality problems, among other things,” the PNA president, Dr. Leah Samaco-Paquiz, said in a press conference yesterday at the PNA headquarters in Manila. CONGRATS TO ALL THE NEW SNA OFFICERS! ">To all Batch 2006 (Invictus), the wait is finally over! 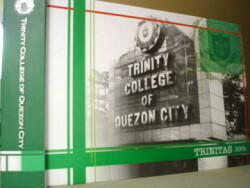 You can now get your yearbook (Trinitas) at the registrar, just sign your name, no other fees shall be collected. Good luck to all NLE June 2008 Examinees! MANILA, Philippines - Nursing students may spend more time in schools and hospitals under Commission on Higher Education's new curriculum due for implementation in School Year 2009 - 2010, GMA news 24 Oras reported Tuesday. Under the CHED memorandum circular No. 5, another 33 units will be added to the present nursing curriculum's 169 units, adding three summer classes to the present 8-semester course. Meanwhile, the number of hours for practicum will increase to 2,499 from the present 2,142-hour requirement. Updated post: Congratulations to Ms. Kristelle Lazaro for winning Best in Cultural Attire Award and for being crowned as Miss Philippines - Fire in the recently concluded Miss Earth Philippines 2008. After participating in the Bb. Pilipinas Pageant last March, our very own alumni, Ms. Ma. Kristelle M. Lazaro will be competing for the Ms. Philippines Earth title. She is the representative of Candaba. Grand coronation night will be held this coming May 11 and telecasted over ABS-CBN. 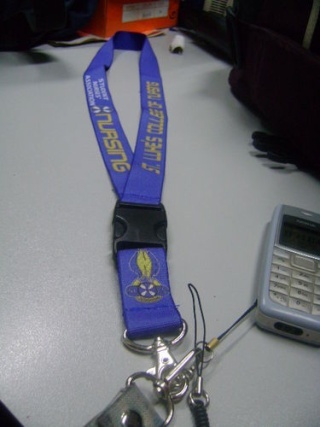 NEW UPDATE: Available na ulit ang SNA LANYARDS for only P120. Available at the SNA office room 204. What's Hot? Nursing Baller Bands. For SALE! this ballers is in preparation for the upcomming intrams. The baller will identify each SLCN student and will be a great souvenir to both alumni and students! TRINITY UNIVERSITY OF ASIA #1 AGAIN! We're so happy for all of you. Once again your batch have proven to be the best! Thanks for giving glory and honor to your Alma Mater, Trinity University of Asia - St. Luke's College of Nursing! To all the new nurses of the Philippines... CONGRATS and God bless you all! Additional Moderators & Future Administrators Needed! For the past few weeks, SLCNWebs received lots of hits/site visits not only from the Philippines but also from North America, Europe, Australia and other parts of Asia. For almost 6 months of existence, SLCNWEBS is now the 2nd most popular in Google when you search for "Trinity University of Asia St. Luke's College of Nursing", just behind TUA's official website. For Yahoo search, last week when we checked for our status, we are at the bottom of the first page of the search result. But now, we're already the 2nd most popular in Yahoo Search. We owe everything to all our site visitors specially to all registered members who logs in and make some posts and updates. It's already the start of a new academic year. Lot's of new nursing students, new opprtunity is up in the horizon. Time to make a stronger bond between students, almuni and friends. we would like to greet batch Magis a happy graduation. God bless your batch and good luck in the June 2008 Nurse Licensure Exam. To God be the Glory! Hail beloved Trinity! 400 plus students from batch amaranth passed. Just like Insignis they will be composed of 10 sections...the rumor before was not true(the 6 section only rumor). Anyway according to a very reliable source the cut rate on the battery exams was even set higher for them... meaning most of them had an excelllent grade on the battery exams. On Behalf of batch MAGIS we welcome AMARANTH to the Next Level of college life on SLCN. And on behalf of the SLCNWEBS family, we would like to congratulate Batch Amaranth! Matutupad na ang wish ninyo mula 1st year na makapagsuot nang Blue and white uniform. Galingan niyo at aral lang nang mabuti. God bless your batch. Good Luck to Ms. Ma. Kristelle M. Lazaro of Batch Centenniales. She is candidate #5 in this year's Binibining Pilipinas. Grand coronation night will be held tonight, 8PM. NURSE LICENSURE EXAM RESULT - December 2007 Out now! CONGRATULATIONS to all the new nurses! Congratulations Trinity University of Asia for being one of the best performing schools in the December 2007 NLE as announced in the radio around 12 noon today. 1st ang St. Louis University. Tapos pangalawa binanggit ng reporter ang TUA but I'm trying to get the whole list para sure kasi reporter lang naman ng radio ang nagsabi habang tinitignan niya yung list. We'll post more updates later as soon as we get more info. Our newest Trinitian NLE Topnotcher! You must be registered online so that you can have full access of our site's services. Please click the link provided below. The link will direct you to the registration process. Be sure to use a valid email address. After completing the registration, a confirmation/validation message shall be sent to to your registered email address so please check your email inbox or even your bulk mails. Just click on the sent validation link. Sometimes, after clicking the validation link, a page that says "Sorry, but no such user exists." will appear but that's ok. Nevermind that message. Just log-in right away. You can sign in normally after that. Sa lahat po nang nagreregister, please don't forget to activate your account by clicking the activation/confirmation link sent to your email address. Sa 4 centers kung saan napupunta ang mga nurses, saan ka ngayon or anong center ang balak niyo munang pasukan?